The focal point of this conversation set from Woodard is a fire pit table that provides warm ambiance for four individuals. The arrangement also includes four swivel rockers with motion bases for gentle rocking relaxation and convenient side-to-side movement. The chairs other standout details include decorative flower motifs, subtly contoured diamond mesh seats and backs, meticulous wrought iron construction and plush cushioning. 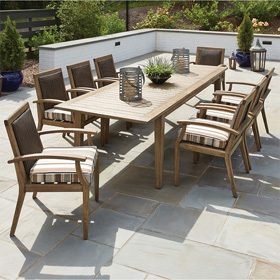 Designed to withstand the elements in style, this complete set will offer hour after hour of outdoor enjoyment. Swivel Lounge Chair 31.5"W x 33"D x 41"H 75 lbs. Fire Pit Table 48"Rd. x 25.5"H 139 lbs.